While fans knew Chris as the sweaty, swaggering Motivational Speaker and the hyperkinetic Chippendales stripper, his family and friends knew him as a deeply spiritual and earnest kid who never stopped trying to make people laugh. 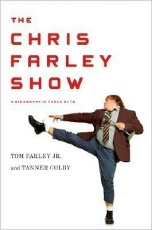 This oral biography includes exclusive interviews with those who knew him best: David Spade, Chris Rock, Lorne Michaels, Alec Baldwin, and other celebrity contemporaries; his brothers Tom, Kevin, and Johnny; and his closest childhood friends. The result is a portrait, hilarious and heartbreaking, of a young man whose battle with addiction began long before he became famous. This is a book about the intersections of comedy, celebrity, performance, and family -- with a deeply moving message about the demons that face even the most gifted among us.